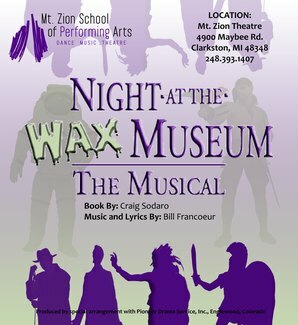 Parent Volunteer SignUp for Youth Theatre March 2019: "Night at the Wax Museum, The Musical"
Volunteer slots for the two Saturday Evening shows begins with Tickets at 6pm on March 16th and March 23rd. Please note: End times are approximates. Must be 16 years or older. In order for us to continue to offer concessions during our shows, we need support from our parents. As such, please do not purchase a ticket for the show because you will not be able to watch the show. Must 21 years or older. We need support from our parents through the entire first act. As such, please do not purchase a ticket for the show because you will not be able to watch the show. I will be purchasing a ticket for the show. I will have a ticket and will be watching the show. The more people we have the quicker we will get done.